After a summer spent trying to prevent a catastrophic war among the Greek gods, Percy Jackson finds his seventh grade school year unnervingly quiet. But things don't stay quiet for long. Percy soon discovers that the magical borders which protect Half Blood Hill have been poisoned by a mysterious enemy, and the only safe haven for demigods is on the verge of being overrun by mythological monsters. 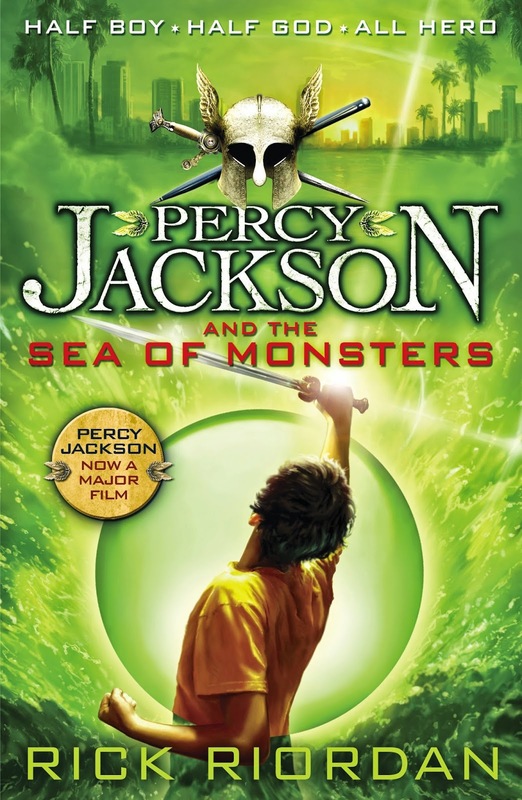 To save the camp, Percy needs the help of his best friend, Grover, who has been taken prisoner on an island somewhere in the Sea of Monsters, the dangerous waters Greek heroes have sailed for millennia. But rescuing Grover isn't the only only monumental task that Percy, Annabeth, and Tyson must tackle. If they don't retrieve the Golden Fleece from the Island of the Cyclopes by the end of the summer, Camp Half Blood will be destroyed. Percy is back. It's been twelve months since Percy left Camp Half Blood and returned home, along with his mother who is determined to provide some semblance of a normal life. With Grover on his own Personal quest and Annabeth spending time with her newly reunited family, it's been lonely. But luckily Percy has a new friend in Tyson to keep him company, especially when a group of monsters attempt to destroy both Percy and Meriwether College Prep. It seems that fleeing to Half Blood Hill may not be enough to protect the son of Poseidon either, as Annabelle brings word that the wards are failing and Thalia's tree is dying, with the camp pointing the finger squarely at Chiron. His replacement is brutal, pitting teen against teen for his own amusement. So when it's determined the camp must be saved, it's time for Percy to hand over the reigns. But Percy can't sit idly by and watch the inner sanction of the camp self destruct. Vivid dreams of Grover being captured force Percy to leave camp along with Annabeth and Tyson, searching for the island buried deep within the Sea of Monsters to rescue their friend. Along the way, their journey intercepts with the Half Blood camper on their own quest and reluctantly form a tentative partnership. They plan to rescue Grover and take The Golden Flecce back to camp, their last remaining hope in saving Thalia's tree and protecting the camp once again. But nothing is ever that simple for the offspring for the Gods of Olympus, and with one of their own working against them, the group may never make it back to camp in one piece. The Sea of Monsters picks up twelve months after The Lightning Thief, with our hero Percy back in New York with his now single mother and attending Meriwether College Prep. Grover is away on his quest, attempting to find what no other Satyr has found before. The past year has been uneventful, even with new friend Tyson by his side. Until the final day of school when all hell seems to break loose, and of course Percy and his friends are in the line of fire, quite literally. They must not only rescue their friend from the Cyclops that is determined to make Grover his bride, steal back The Golden Fleece, rescue the camp from being overrun by monsters and heal Thalia's tree. All in a days work for young Percy. I actually enjoyed The Sea of Monsters more than it's predecessor, it was humourous, sassy and highly entertaining. But most of all it featured new character and Cyclops Tyson. His character was an absolute delight, his fascination with ponies and childlike innocence was incredibly lovely. Ending with a surprising revelation, I can't wait to jump into book three. The Percy Jackson series is not only fun and entertaining, but wonderfully written. A must have for middle grade enthusiasts, lovers of young adult and adults alike. I'm utterly in love. O'Riordan's writing skills is insane, isn't it? I almost wish I'm a big fantasy readers just so I can experience it first hand. Obviously, I'm only basing my comment on his writing because these books sound ah-mazing. All these creatures, myths and legends sound so well conceived! I'm actually not a fan of fantasy usually, but this series has completely hooked me and it's only book two. It's just so incredibly entertaining. Give it a go Joy, the series is just brilliant. I simply loved this book. Percy is as always amazing and Tyson was great. So happy you are enjoying this series. Thanks Aparajita, I'm absolutely loving it! My only regret is that I wish I'd discovered it's brilliance much earlier. Already planning on reading the spin off series as well. Yep, sure did love Tyson - and the brilliant thing is that he lasts the whole series (well that's what I think from reading quotes with Tyson in them!) so can't wait to read the next book too! That's the first thing I asked another Percy Jackson fan who had already read the series, is Tyson in the next book? I loved his character and makes me even more excited to pick up book three now. Mawa, you'll be happy to know Tyson makes multiple appearances in the rest of the Percy Jackson and the Olympians and in the Heroes of Olympus Books :-) :-) He quickly became my favorites. Thanks Sarah. I'm even more excited that he's also in the spin off series. Wonder why he wasn't introduced in book one though. That's great you liked this even more than the first...since it means you want to read on! I haven't read any of these, but a friend of mine read some I believe and really loved them. Even though they are considered middle grade, I can almost guarantee that most adults will absolutely adore this series as well. You should definitely give them a go, super entertaining. Percy Jackson is life! I loved it even if it's a Middle Grade book. :) I love reading about the adventures and think it's great that Rick Riordan teaches history and mythology at the same time as telling a highly entertaining and indeed sassy story. :) Love the review! Thanks Renee. I can't believe it's taken me so long to actually start reading these. I absolutely love the series so far and it seems to only get better with each book! I just started reading the Percy Jackson books this year and I loved them! I'm hoping to move on to the Heroes of Olympus series next! I love how Tyson and Percy's relationship grew! I agree with you the series gets better after the first book and it's great for all ages! I couldn't agree more Taylor. I'm so far outside of the intended demographic, but I absolutely loved them as well. I can't wait to get stuck into book three. They're short reads, but pack so much fun and snark in there. WHAT IS WITH EVERYONE REVIEWING ALL MY FAVOURITE BOOKS TODAY?! Anyway...YES YES YES YES! Percy Jackson is the only way to live your life, and I am so glad that you are loving these books--pffft not that I doubted you wouldn't or anything. It WAS a lot of pressure though. You DID threaten to denounce our friendship if I didn't enjoy the series. Luckily I did, even more than I thought I would have. Friendship is still intact thankfully. You could have told me how awesome the series was sooner. Or just thrown a book at me. I can't wait to continue on with book three shortly. I haven't even come close to finishing the series and already splurged on the spin off. Even the first book in his Cain series as well. Don't be surprised if over Christmas that everyone pops on here to see some sort of Percy celebration and just fangirling reviews. I can already see I'm headed in that direction. You totally should. If anyone could love this series even more than I am, it's definitely you. The puppy needs you to read to him. Come on, you're a fur mummy now, you have a responsibility to your fluffy child. Gah, and another person has read and loved this series, leaving me in the dust by my lonesome. Haha. You guys and your praising reviews are loading immense pressure on my shoulders... makes me wonder what the heck I'm doing that I'm not reading it. I need to get past the first book... I've been stuck on that, but people tell me it gets better in book 2. Hopefully I endure! Great review, love! It really does Faye. And I know how much you enjoy awesome middle grade as well. Book one was really good, but this one was incredible and blew book one away. You need to continue onto this one before deciding, I have a feeling you'll completely fall in love. Anyway, I have given up on this series. I don't know why. I still have the books but I stopped on Labyrinth. I HAVE TO FINISH IT SOMEDAY! Great review, Kelly! Which one is that one? Book four? Maybe you just needed a break and to read something else for a while. As much as I'm loving the series, I'm not sure I could marathon read it. I pick it up when I've had a few crappy reads and it never fails to cheer me up and concrete my love of reading again. They are just those kind of books. Hopefully you can finish the series off soon Paula, would be a shame to let it go when you're so close. YESSS I am so glad you have picked up The Sea of Monsters and fallen in love with this series. I did love Tyson, he was such a sweet character. Lovely review Kelly!